Each of these little trays has a deeply embossed lace texture which can be easily seen and felt through their golden coral, creamy yellow or green glazes. The variation that comes from being completely handmade lets you use them with a friend and keep them straight. 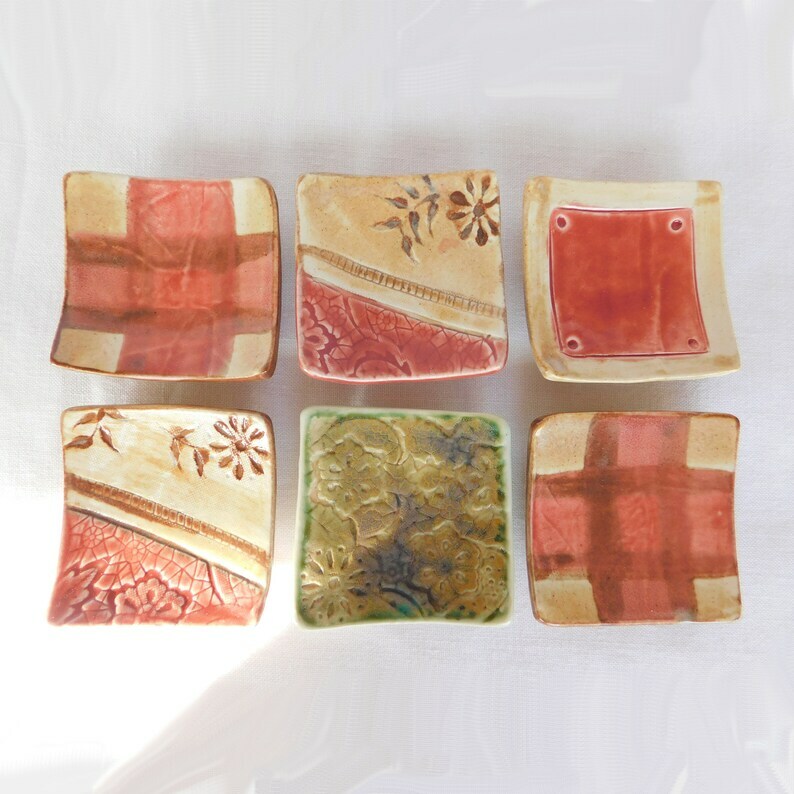 These tiny, square, handmade, porcelain plates have as many uses as an imaginative mind can think up. They make excellent teabag holders, tea light candle holders, butter pat dishes, wedding favors, jewelry catch trays by the sink, pin trays on a dresser, paper clip trays on a desk, gifts for teachers and so on. Measurements: about 2 3/4"(7cm) by 2 3/4"(7cm) square by about 1/2"(1.3cm) high. 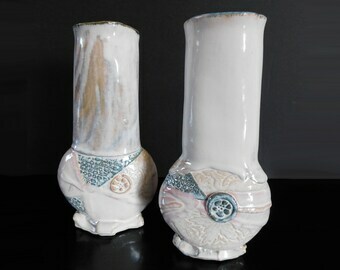 Materials: Porcelainous stoneware fired to 2300 degrees F.
This lightweight piece ships (by itself) by USPS First Class Parcel. Multiple item orders ship by USPS Priority Mail and may actually have a lower per item price due to decreased shipping costs. Message me if you would like me to list a multi item order specifically for you. If the variations chooser is not specific enough for which one you want just message me with your choice(s). WHOLESALE PRICES available for bulk wedding favor orders and for resale.